This is the third trip of the 2018 shark season, and all I can say is that it has been sharky, sharky, sharky!! On this trip, we have had some larger females show up, but the star has been one of our favourite male sharks, “Kenric,” who has been very active and curious around our cages. We have had some incredible breaches, it’s amazing to watch as their whole head and most of their bodies come out of the water and observe the magnificent power of their jaws. The surface cages have been superb, our guests were so excited they could not stop taking selfies! 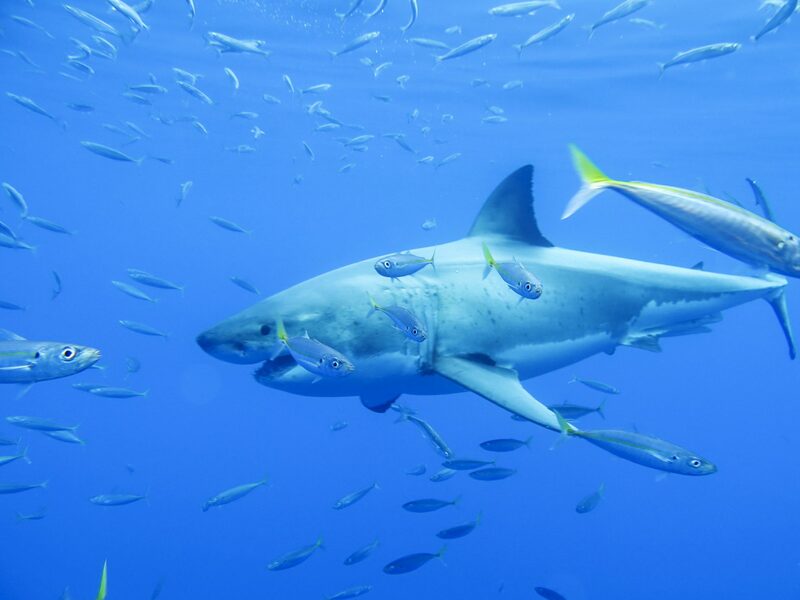 It has been an amazing start to the 2018 season at Guadalupe Island with the great white sharks so far! We have had up to five sharks going around the cages at once, but Kenric has been our STAR!! He has been kicking our butts all day long with the tuna we wrangle! And in the morning he did two whole-body breaches! I think he was kind of showing off… either way, it was spectacular! One was the best great white shark breach I’ve ever seen. I can’t wait until tomorrow to see what happens! Para mi este es el comienzo de la temporada y puedo decir que Guadalupe me ha recibido mejor de lo que podia esperar. Me han resivido mas de 6 tiburones juntos de una vez con mas de dos femeles y tres machos, uno de ellos el gran Kenric el tiburon que mas me gusta. Estoy realmente feliz de estar una vez mas aqui entre dinosaurios. What an awesome first day! It started a little slow but then juvenile sharks began coming, one after the other, and then the biggest one yet, a male, who is apparently is called “Silent Hunter” (not confirmed yet), showed up. Also, an extremely curious female (she may be “Bumped Chin,” waiting on confirmation) has been coming super close to the cages and bumped one! Then at the end of the day, something that really surprised me: a shark arrived who had been bitten very badly. It looks like his attacker ate half of his face! He has a normal side, and then the other side looks like an anatomy model, the gill is completely exposed, no meat and no skin is visible, just the gill. It is crazy to see, and we hope that somebody was able to get a picture of it. Of course, the extraordinary thing is that the shark is still alive and doesn’t seem to care a lot about it! Other than that, the island look gorgeous as always, the water temperature is comfortable and visibility is around 25m! The dream of every diver (or at least the majority that I meet) is to dive with great whites, and I get to see them almost every day! How lucky am I?! They are the most wonderful, powerful, majestic and beautiful creatures. On this trip, we have seen up to six sharks at the same time and super close. Our guests are jumping straight from the submersible cages to our surface cages. Visibility has been great, 20 meters plus, and we have already identified four of the sharks we saw today! Tomorrow is our last day at Guadalupe for this trip. Let’s see what the day will bring! When I take a moment to think about all the things going on around me, is actually a bit crazy. We basically sleep a few feet above great whites, and I work where people’s dreams come true after years and or even whole lives spent waiting. I work and live where paradigms break apart and expectations stay short. I spend 3 hours 8 meters a day below the surface observing one of the most beautiful and powerful creatures that has ever existed on the planet, 180 miles from the mainland. I love and admire the great whites so much! 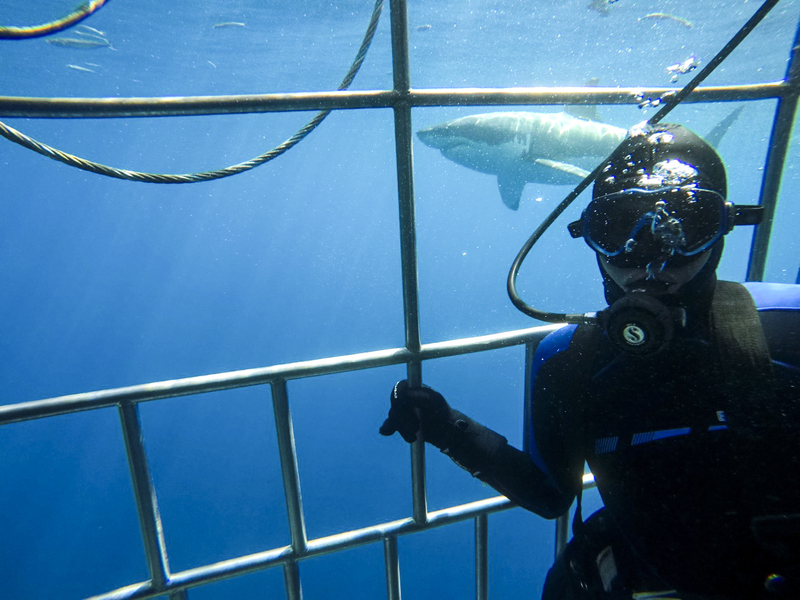 This is a special trip for us as Martin Graf from Shark Diver, who is a white shark veteran with over 20 years experience at Guadalupe makes his first of 8 trips this season with Nautilus Liveaboards! Crew and guests alike are very excited to have so much knowledge for us to consume and stories to take in. What a pleasure it has been. Our mornings as of late have not let us down with 3-4 sharks within the first hour or two both swimming in the depths below the boat, and very curiously coming to check out our hang bait from the wrangling platforms. 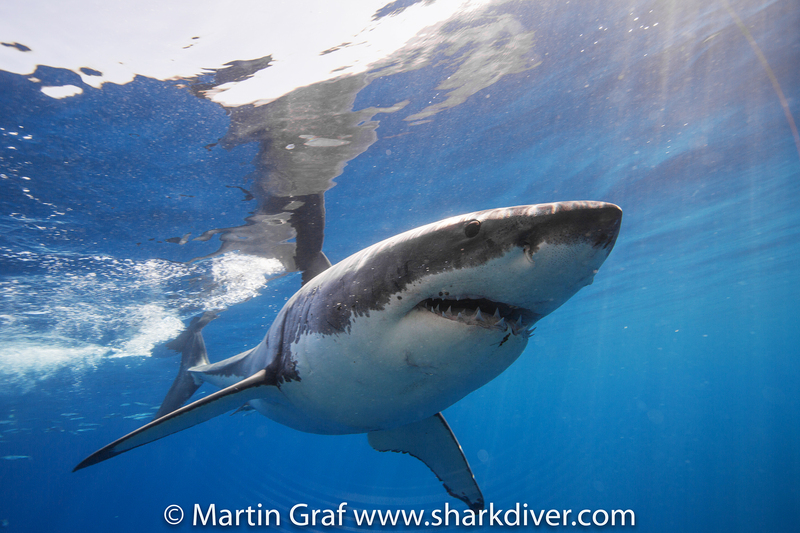 Day one and two have been very exciting with 9-10 individual sharks, both male and female throughout the day. Its official, the Guadalupe 2018 season has started, and I can’t wait to see whats next! Considering that today was the first dive day, it was a great start. We have had sharks at every hour. The slowest moment of the day was the lack of a shark for only 5 minutes! There were at least 13 different sharks today. We identified nine of them with the help of our shark expert guest Martin Graf: Luca, The Legend, Kenric, Paul Walker, Drogin, and Mao to mention a few. It was an amazing day and we still have two more dive days. I’m looking forward to seeing more sharks and maybe some new ones! We have had an incredible day, finishing another great trip. 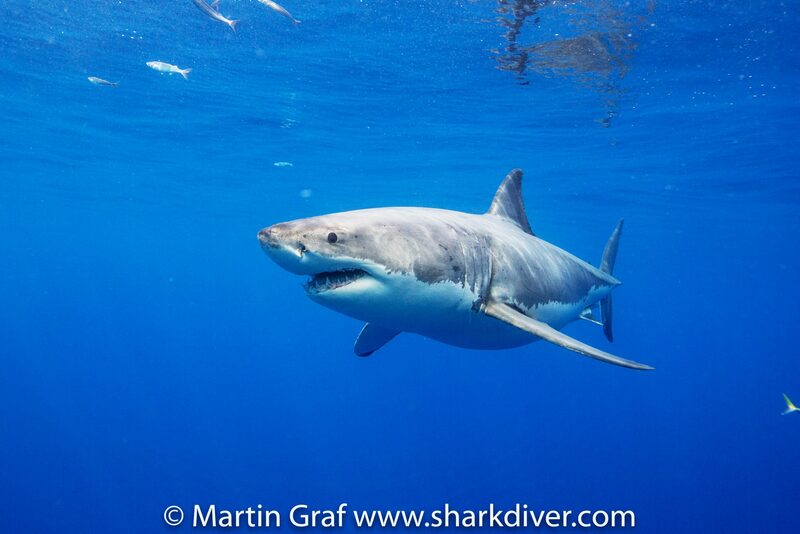 The sharks today were spectacular, even for our experienced guest, Martin Graf! We counted at least 20 different sharks!! Some of them were in transit, but a lot of them stayed around and attacked the bait. 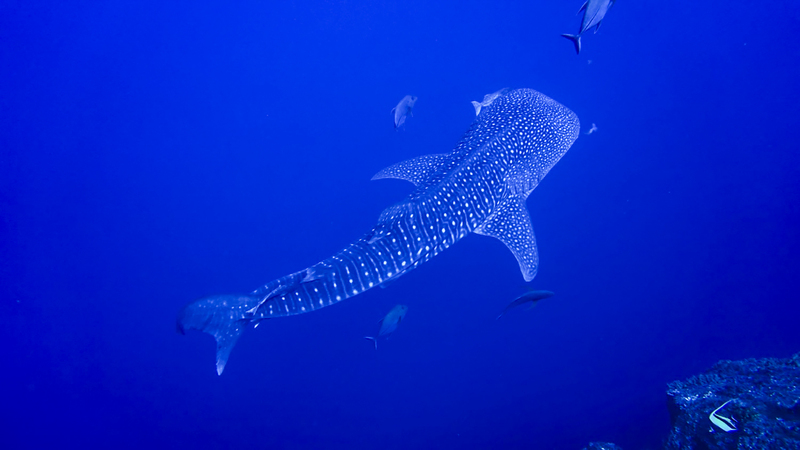 All our divers got the chance to have great sightings frequently! Shark Diver’s First Trip on the UnderSea Goes Swimmingly!